An extensive study in Afghanistan shows only small signs of improvement in some aspects of gender discrimination. The research conducted by Afghanistan Research and Evaluation Unit (AREU), with financial contribution and in close coordination with Swedish Committee for Afghanistan (SCA), has aimed at an in-depth understanding of various notions of being an Afghan man and its contribution to gender inequality in four provinces of Afghanistan. The study deals with the ways men’s attitudes, perceptions, and actions influence the lives of women in Afghan communities. According to the ARUE, the overall purpose of the research is to achieve an in-depth understanding of different notions of being a man in Afghanistan and how they contribute to gender inequality. It depicted great degree of consensus from respondents toward believing that males should be the breadwinners of the family and only men has the responsibility to procreate, support, and protect the family and country. “Regarding the roles of women, the participants and informants in all provinces stated that women’s responsibility is to manage their homes”, it states based on the views of overwhelming 85 percent of the responders. There is also a general acceptance that women are not capable of making decisions regarding marriage, with mature respondents showing a higher inclination to believe this notion, it adds. Sayed Mehdi Mosawi, one of the lead author told fairplanet that these trends were particularly worrying considering the years of struggle and investment by the international community and local civil society towards women rights in Afghanistan. “It seems these efforts have left no impacts”, he feared. “The most worrying sign for us was the fact that some 60 percent of responders to our study showed acceptance towards violence against women”, Mosawai said. In many conservative Muslims societies like Afghanistan, men are permitted by religious leaders with limited knowledge to beat women in the family if they do not obey the men. “Many of our responders, both men and women said they know violence was not the right way but they said it is permitted by the religion”, Mosawai mentioned. Last year, a mob-lynching of a young woman in the capital Kabul received world-wide condemnation. For some, Farkhunda; the victim of this act became symbol of defiance for women as they carried her coffin on their shoulders in clear contrast to the cultural norms of the country. Observers believe repeated incidents of violence against women however, indicated women remains “second class” citizen in Afghanistan. Earlier this month, rather depressing news emerged from northern Faryab province where a husband brutally chopped his wife’s nose over alleged adultery. Pictures of the victim depicted a grim reality of the state of affairs as to how women are continuously oppressed in the rural parts of the country. The vibrant civil society in Afghanistan bravely condemns the repeated acts of violence. 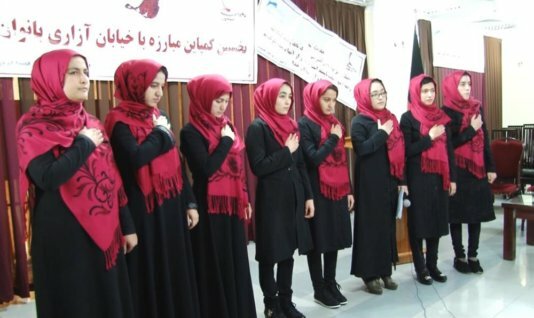 Just days after this horrific incident, a group of young Afghan women launched one of a kind campaign against women in the western Herat province. These brave young women said at the launch of this one-month long campaign that even those female who are allowed by their families to study or work out of home face many challenges in the Afghan society. Zahra Wanda, head of this campaign told journalists that main objective of this campaign is to raise voice and make people realize women harassment in public places was a pathetic thing to do and it would not be tolerated by the Afghan women. “We would like to address the causes leading to street harassment and create awareness about its devastating impacts on the whole society”, she said. Zahra noted that it was frustrating to see that mostly the young urban youth was indulged in this crime hence the campaign would focus on the youth. For the lead writer Mosawai, a worth-cherishing thing that emerged in the study was the fact that more and more Afghans, both in the rural conservative areas as well as the liberal urban neighborhoods are in favor of education for female. “This makes us very happy and hopeful about things to change for good in the future”, Mosawai said. There is also a general acceptance that women are not capable of making decisions regarding marriage, with mature respondents showing a higher inclination to believe this notion.